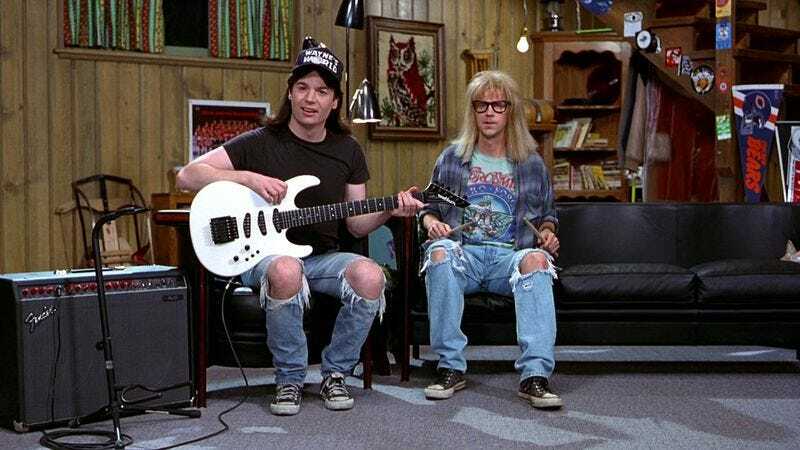 Here’s a reason to get out of your basement and into your Mirthmobile: Wayne’s World is coming back to theaters in honor of its 25th anniversary. The SNL sketch-turned-comedy classic will screen February 7 and 8 around the country. You can the full list of locations where it will play here. Slash Film reports that each showing will also include a recorded talkback with director Penelope Spheeris and cast. According to the “Birthday Bash! !” website, the discussion will be on “making and legacy of this pop culture phenomenon” and feature the likes of Cassandra herself Tia Carrere, and Robert Patrick, whose tiny cameo in the movie we guess warrants his presence. “More” guests are also teased, but it’s unclear whether that means Mike Myers and Dana Carvey or Michael DeLuise and Kurt Fuller. Aurora, Illnois—Wayne Campbell’s hometown—is also planning what the Chicago Tribune called a “six-month-long celebration of the movie,” which gets underway February 3.